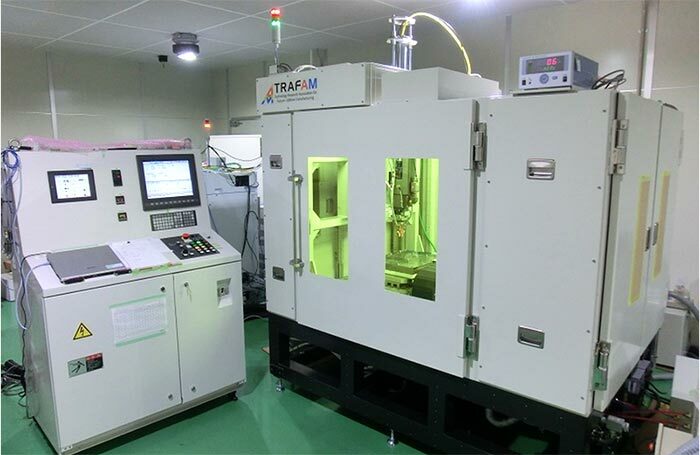 Toshiba Corp., and its machine tools unit Toshiba Machine, have announced an interesting new development in the 3D printing of metal objects. A new prototype 3D metal printer designed by Toshiba delivers 10x faster output speeds than the most commonly used powder bed fusion sintering printers. The new 3D metal printing design uses laser metal deposition (LMD) technology which deposits metal powders then melts it with a laser to build up a 3D form. So far - so ordinary – however Toshiba has an innovative powder depositing nozzle that makes a huge difference to the performance of the machine. We are told that the nozzle design is derived from Toshiba's know how in fluid simulation technology. This new nozzle deposits metal powder to a much smaller focussed area than competitor machines and a highly precise laser beam follows up, sintering the metal in place. According to Toshiba's internal testing, a machine with an 800W laser can fabricate objects with a speed of 100cc per hour. Furthermore the prototype is capable of building larger structures at a lower cost than current methods, says the Japanese firm. A variety of metals including stainless steel, Inconel and iron can be used by this 3D printer. Toshiba says that it is currently developing the prototype to achieve further increases in speed and resolution, as well as better software interoperability. The resulting LMD 3D printers will likely reach the market by 2017. Meanwhile the prototype, as pictured above, will be showcased at a Tokyo trade and industry show from 2nd to 4th December, that's just a week from now. deleted. wrong section for my reply. These machines can print Inconel steels, which can be used in aerospace products. NASA and SpaceX have 3D printed engine nozzles, which makes for a cheaper and stronger product because it avoids machining multiple parts, and welding or brazing. If this new machine can get the fine detail too, that's very impressive. This is really cool stuff that's going to change several industries. I would print serious looking 22 inch Rims with this tech……. From the picture it's clearly an industrial device, so I'm guessing high 5 digits into 6 digits. I used to work for a well known aerospace engineering company and we were investigating an additive manufacturing process called “shaped metal deposition” in 2004, which had been developed in house. This used a robotic TIG welding machine that was developed to manufacture near net shape components from Ti 6/4 alloy. Essentially you'd build up a shape by continuous welding, which could then be machined to produce the final component. This drastically reduced time for manufacture and of course wastage. The material properties were far superior to casting with the same alloy. Typically you get a small degree of porosity as you do with casting and it seems that laser sintering produces similar porosity, but also produces similar properties. I suspect that one difference is the resolution at which laser sintering can operate on. TIG is dependent on a number of parameters and those preclude very thin sections. Laser sintering is a “finer” process so you can make thinner sections. However, one has to bear in mind cooling rates and the affect this has on the microstructure produced, so a heat treatment step (or more) may be needed to get the desired properties for the full component. It's interesting to see just how far additive manufacturing technologies have come. They are still a niche way of production, but they are slowly being used more often. This technology will only grow and grow. The beauty of it is you can switch powder or feedstock along with the shape and parameters very quickly. It's an excellent prototyping tool that ultimately we will come to use fully in full scale manufacture. Maybe some day they'll be in everyone's garage.